January 24, 1952 – Judge Benjamin P. Epstein of the Circuit Court rules that the Chicago Park District has the right to construct underground parking garages in Grant Park along Michigan Avenue and to finance the project through the sale of revenue bonds. This is a test case in which the plaintiff, the Michigan Boulevard Building Company, asks for an injunction restraining the park district from selling the revenue bonds, “contending that as a nonprofit corporation the park district has no right to issue the bonds or pledge revenue from them.” [Chicago Daily Tribune, January 25, 1952] The suit also asks for a declaratory judgment that would uphold the claim that the park district has no right to permit use of park land for the garages. A year earlier the Illinois legislature passed bills that allowed the park district to construct the garages and to finance them through the sale of bonds. 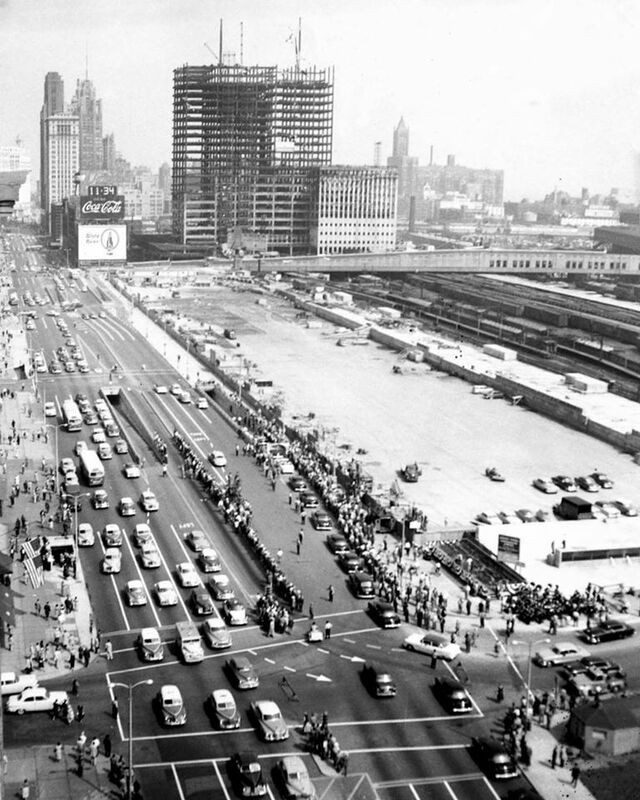 The first of the proposed underground garages would open on September 1, 1954. The dedication of the garage is shown in the above photo with the partially completed Prudential building in the background. 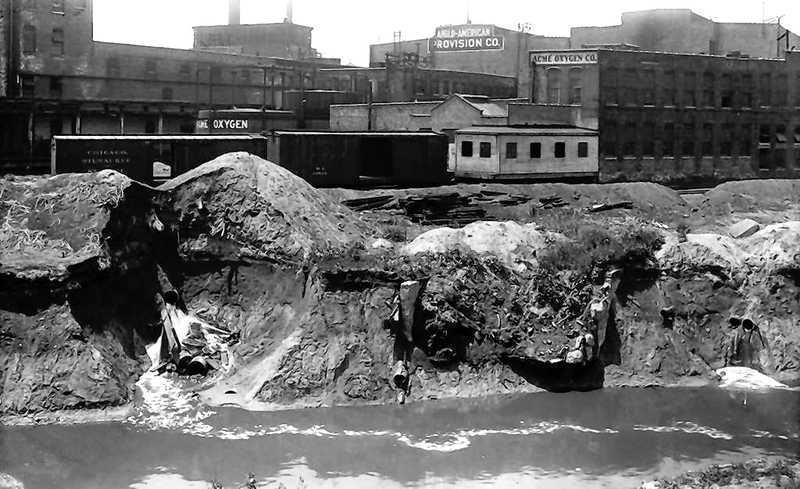 January 24, 1913 -- At a joint meeting of Chicago Sanitary District officials, aldermen, and representatives of the meat packing companies on the southwest side of the city, agreement was reached to discontinue the use of Bubbly Creek as a drain for the sewage of the stockyards. The attorney for the district said, "The policy of the district always has been that the disposal of the industrial waste in the yards is an individual one for industries there. They can't have their waste discharged into Bubbly creek and from there into the Chicago river or into the canal." It was, of course, too little and too late. The damage had already been done. The unfortunate body of water begins at what once was the northern boundary of the massive Union Stockyards just north of Pershing Road about halfway between Ashland and Racine and flowed north into the Chicago River. According to a 2011 article in The Chicago Tribune when scientists studied the waterway in 2004 they found "fibrous material" on the river bottom up to three feet thick. You can define "fibrous material" any way you want, but however you define it, it ain't good. It's still there, and it's still a-bubbling.